My in-law policy is working so well, I've created a naming policy for my family tree. are you recording both names? In my last article, I wrote about how freeing it can be to set policies for building your family tree. My new policy for handling the in-laws of distant relatives has been incredibly helpful. This past weekend I found 29 more people who were in my family tree simply because they were an easy get. 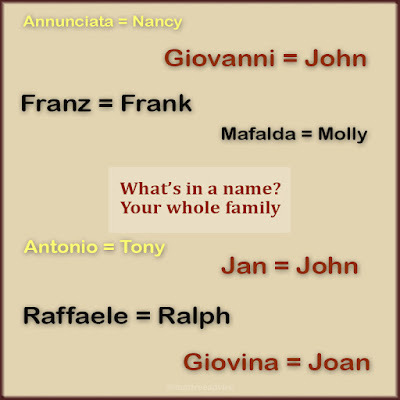 For instance, a man named Giovanni married one of my distant relatives in New York City long ago. I do want him and his parents in my tree. But I no longer want his 8 siblings—or any of their spouses and children—in my family tree. So I removed them. And if I ever wanted them back, the census sheets where I found their names are still part of my tree. I'm keeping the documents because they contain Giovanni and his parents. This in-law policy makes me happy because it's always there to guide me. It'll keep me from reaching out too far. It'll put an end to those awkward messages I get from people wondering why their grandfather is in my family tree. It makes me so happy, I want to consider other genealogy policies. I didn't have to think too hard about it before I realized—I already have another genealogy policy. What I'm about to describe is not an established, official genealogy rule. There's a good amount of personal preference. So think about your own personal preferences as you read on. I'm putting my naming convention policy in writing. But it's based on practices I already follow. This is the style I've developed over the years. Now, with a policy in place, I'll be sure to be consistent. If your ancestors emigrated to a country with a different language, they probably went by a different name. Giovanni became John. Anton became Anthony. Pablo became Paul. I record my ancestors using the name on their birth record. If I haven't seen their birth record, I check each census. If they were born in another country, and on some censuses they use an ethnic name, then I believe that's their given name. In Family Tree Maker, I use their birth name as their Name fact. 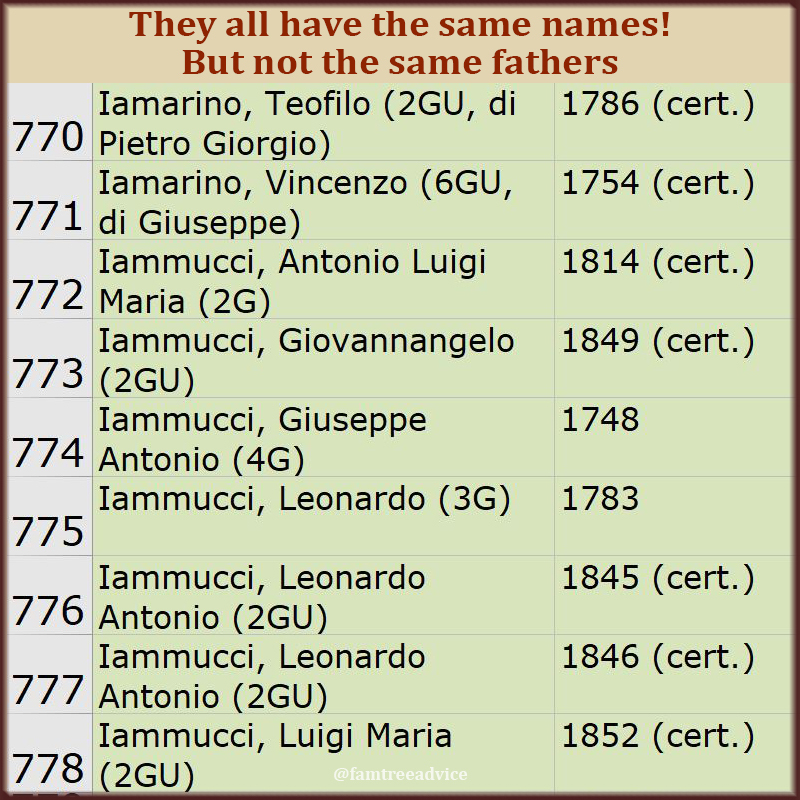 Record multiple names for your ancestor if they unofficially changed their name. In their new home in a new country, many of our ancestors tried to fit in. They identified themselves by a non-ethnic name, like Mary instead of Maria Rosa. We don't want to lose track of those new names. The new name is likely to be what's on their death record. In Family Tree Maker, I record their common, or assumed name, as a second name fact. The software lets me add multiple names and set one as the preferred fact. Their birth name is that preferred fact. Last names are important, too! If your ancestor changed their last name in their new country, you need to record that. You can make it their alternate name—their non-preferred name. For example, I have ancestors named Muollo. That's so hard for an American mouth to say, that one Muollo man changed his name legally to Williams. That may seem like an odd choice. But you pronounce Muollo as mwoe-low. That could sound as if you're mumbling Williams. I need to record the Williams name because that's the legal last name of this man's children. Everyone in my parents' Bronx neighborhood in the old days had a nickname. In my family there were men called Baldy and Blondie. People in the family never called them anything else. So I need to preserve those colorful nicknames in the family tree, too. 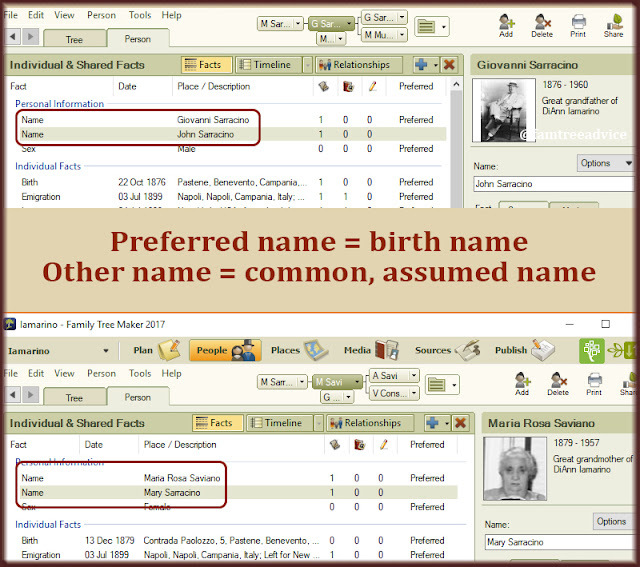 In Family Tree Maker, I record a nickname with the AKA (Also Known As) data fact. Having spelled out this policy, now I'll be sure to fill in what I'm missing. I've been working on my document tracker a lot lately. This is a spreadsheet where I log each document I've found for the people in my tree. Everyone who has a document image gets a line in the document tracker. closer ancestors, and their father's name. Filling it out helps me realize which documents I'm missing for each person. It encourages me to do more. Lots of times I'll enter something in the "Need to find" field, like "1902 immigration record". Then I think, "Why not search for it right now?" And I know I'm doing good work. Here's where I'm using a naming convention in my spreadsheet. I have tons of people in my tree with the same name. Don't we all? In the small towns where my ancestors were born, many men had the same name. 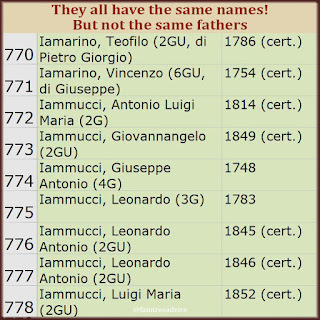 On the town's birth records, the mayor would sometimes write the new father's name as, for example, "Giovanni, son of Giuseppe". So I'm doing that in my spreadsheet. 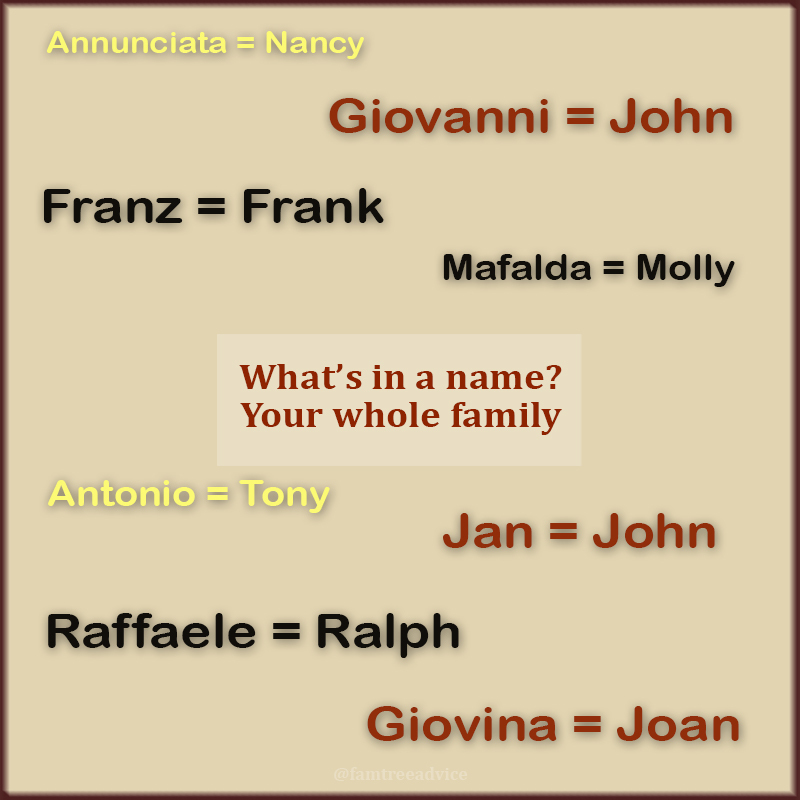 After a person's name, I add, in parentheses, (son of Giuseppe), or whatever the father's name is. That helps me when I need to locate the person in my family tree. I also like to identify certain close relatives in the spreadsheet. I use this shorthand: 2G is a 2nd great grandparent, 2GA is a 2nd great aunt, 2GU is a 2nd great uncle. What naming conventions are you using? Are you being consistent? Spend a little time thinking about the names in your tree. What policies can you set to make your family tree make more sense?